This is the seventh year in which the Lumina Foundation has shared attainment rates in its annual report, "A Stronger Nation." This is the first year, however, the nonprofit organization has been able to include data on postsecondary certificates. Those numbers came from nationally representative survey data gathered by NORC, an independent research organization based at the University of Chicago. Data on attainment related to college degrees came from the U.S. Census Bureau 2014 American Community Survey. When Lumina began its reporting in 2009 (which shared 2008 data), the attainment rate was 37.9 percent. The foundation is an organization that promotes greater participation in post-secondary education in the United States, especially among underrepresented and high-needs groups. One of its major initiatives is a push for 60 percent degree and certification attainment by 2025. These metrics reflect what Lumina Foundation considers "critical" for increasing attainment. Awareness refers to the percentage of Americans who believe it's important to increase the proportion of Americans with a degree or credential beyond high school to 62 percent by 2015; enrollment references an increase of total higher education enrollment to 18.77 million by 2015; persistence refers to an increase in the number of students persisting from year one to year two of college to 70 percent by 2015; and completion refers to the increase in the overall annual higher education completion rate for students to 57 percent and the degrees awarded to 3 million by 2015. The latest numbers foretell probable failure on that goal. "Despite the progress as a nation, it's clear that we're far from meeting 'Goal 2025,'" said CEO and President Jamie Merisotis, during a briefing. "Based on our projections, roughly 10.9 million additional credentials, degrees, certificates or other high-quality credentials are needed to meet the goal. Those need to come from those people who represent our future, particularly low-income Americans, under-employed adults, first-generation students and students of color." According to Lumina's projection model, about 35.7 million people will earn post-secondary credentials that count toward Goal 2025 if the current rate of degree and certificate production continues. The foundation undertook the goal in the first place, Merisotis added, because it believes that post-secondary learning "is key to meeting the nation's growing need for talent both economically and socially." It's not the credential itself that matters so much as what it represents. "The credential is a sort of currency, a way of representing the learning that's inherent in that credential — in other words the knowledge, skills and abilities a student developed while actually earning that credential," he said. Degree attainment rates among U.S. residents aged 25 to 64 vary widely by population group. Whereas 61 percent of Asians hold degrees and 45 percent of whites do, attainment is dramatically different for other population groups. For African Americans, the rate is 29 percent; for Native Americans it's 24 percent; and for Hispanics it's 21 percent. All but one group has inched forward in attainment from 2013 to 2014. The exception was Native Americans, whose attainment dropped from 23.86 percent to 23.74 percent. The will to pursue post-secondary attainment, whether in the form of a degree or a certificate, is high among Americans. Data from a 2016 Gallup-Lumina study of the American public's opinion on higher education found that nearly six in 10 respondents (58 percent) considered a degree or credential beyond high school "important." Among minority populations, the belief was even stronger. Seventy-one percent of Hispanics and 70 percent of African Americans held that view. Those populations make up about a third of the 15.2 million students enrolled in post-secondary programs. Of Americans aged 25-64 who have achieved post-secondary degrees, nearly 9 percent have earned an associate degree, 20 percent have earned a bachelor's degree, and 11.5 percent have achieved graduate or professional degrees. Another 21.5 percent have "some college" but no degree; 26 percent have graduated from high school or equivalent; and nearly 12 percent have never graduated from high school. Houston-The Woodlands-Sugar Land, TX: 37.1 percent. 3.3 million could come from people who hold a post-secondary certification as their highest credential. This is a more nebulous criteria, since the certifications need to meet Lumina's definition of "high quality." "The simple definition is that this has to be a credential that leads to further education and employment," explained Merisotis. "These credentials actually have to have value that can be demonstrated to lead to further education and employment." All three variations encompass what Lumina calls the "post-traditional learner." More of these will be students "who are not well served by current systems": those who are older, first-generation and from population groups that will require additional supports. "Serving these students better — and thereby closing gaps in attainment — is essential to increasing attainment rates overall." 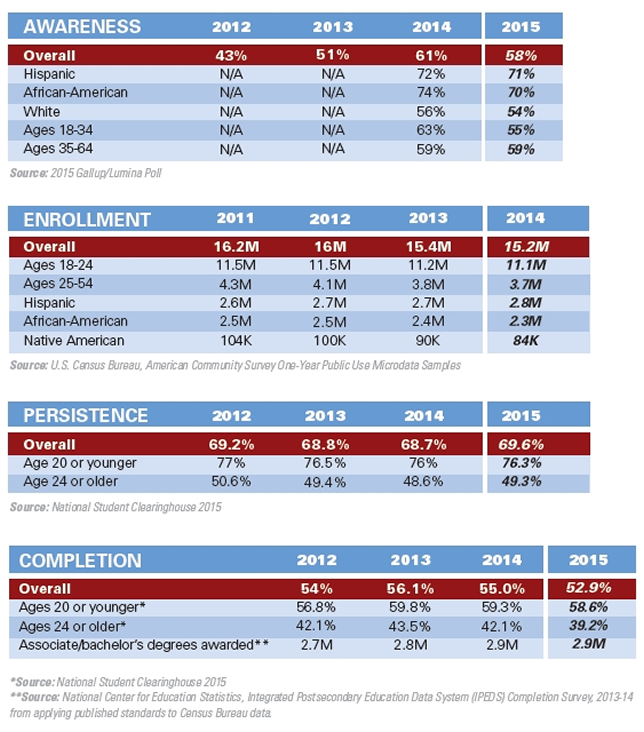 Although technology receives no direct mention in the 2016 report, Lumina has long supported its use for helping to "mobilize" higher education, such as promoting the use of data to develop policies and practices that show evidence of improved completion rates and setting up a grant program for community colleges to participate in its "Right Signals" initiative, intended to bolster alternative forms of "quality credentials." The 218-page Stronger Nation annual report is available on the Lumina website.